Self-Discipline helps us greatly in goal-setting and goal-getting. It puts us in control. But once we allow self-discipline to slip, there are 3 Powerful P’s of Failure ready to take the reins. Procrastination: Putting off until later what could (and should) be done right now! We are all guilty of falling into the trap of procrastination. When defining procrastination for young children, you can call it a monster called “Mr. Delay” who gets you to wait another day…and another day..and another day before getting to the things you need to do. Helping children to prioritize and set up an action plan so that action items takes place at a specific time each day or each week can help to crush procrastination. When we charge towards our goals, things change. It’s human nature to want to stay at our comfort level. We want to achieve our objective, but we also want everything to stay the same. When working with children, you can help them to understand that it’s perfectly normal to feel uncomfortable when striving to achieve something we desire and it will be worth it in the end. It is also important to keep reminding them why they wanted to achieve the goal in the first place. Projection: The dog ate my homework! Projection means assigning the blame to someone else when a goal is not achieved. We continually hear; “my parents forgot to put my homework in my bag,” or “The teacher didn’t explain it properly and that is why I didn’t get a good grade.” When we blame someone else when we do not achieve a goal, we are being like the projector. The person or thing we blame is the “screen.” The only way to consistently achieve our goals is to take full responsibility to get things done and own the consequences of not taking action. When we project blame onto others we give them the power to decide the outcome of our goals and dreams. Self-Discipline is one of the most powerful forces in goal-setting and goal-getting. Help your child conquer their goals and achieve their dreams! Self-discipline is a key life skill that allows people to achieve their dreams and succeed. Those who learn this skill early in life are way ahead of the game. 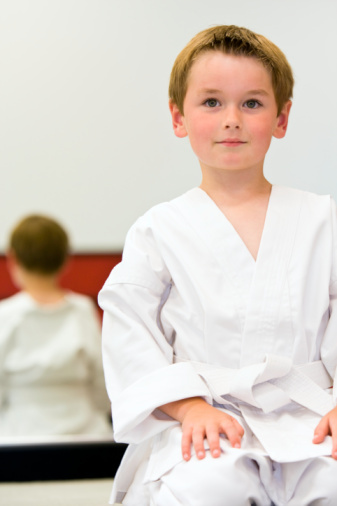 Participation in martial arts that stress self-discipline can go a long way in helping your child prepare for the challenges they will face in life.